When ever you start a new project you should always run a scaling test. All this is is running your system in parallel with a different number of processors. By plotting this, you can determine the optimal point at which it makes sense to run your calculation. You do not want to waste computational resources now do you? A frugal computational theorist keeps their adviser completely happy. where is the total cost of the calculation, is a charge prefactor >= 1, is the wall time of the calculation, and is the number of cpus used in the calculations. As you can see, this will be directly proportional to both the wall time and number of cpus; an efficient calculation will find the sweet spot in the calculation time and the number of cpus used in the calculation. As an example, in the following figure you can see some scaling data that I have compiled for Quantum Espresso for a simple silicon calculation. I know this scaling looks terrible, there was a small error in the compilation so it made for a great example for this blog post. As you can see, it doesn’t make sense to run a calculation with more than 16 processors. 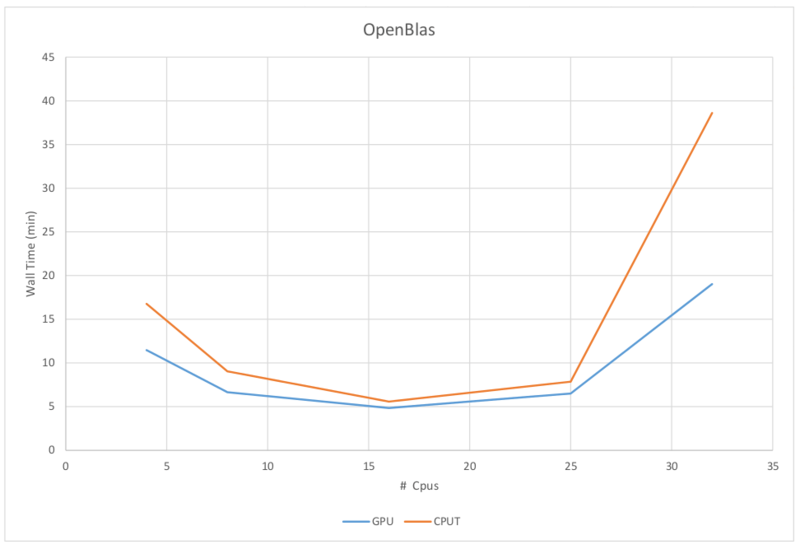 A scaling example showing QE data for CPU and GPU calculations. Say, hypothetically, you are running on a cluster with 32 cores/node where you have this version of QE installed, what makes sense to run? You might say ‘Well, Levi, 16 cores seems to be the minimum, and it actually takes longer with 32, so I am going to use 16.’ That would be a fine choice, but almost all supercomputers will charge you for running on the whole node at a time. I.E. even though you are only doing computations on 16 of the cores you will get charged as if you are running on 32 cores. The key thing we are doing here is creating two functions, one called loop1 and the other called loop2. In this case I was generation a lot of data as I am currently working on neural network methods which require a lot of data. In each loop I am able to set the GPU I want to run on with export CUDA_VISIBLE_DEVICES which readily allows me to use both GPUs in one calculation, drastically speeding up the calculation. I then call loop1 and loop2 and immediately fork them to the background (with the &). Finally I call a ‘wait’ command which will keep this script running until both loop1 and loop2 complete. In this way, I can use all 32 processors while performing two calculations at once, effectively getting the most bang for my buck. You could do the same if you had any number of processors on the system. There is no limit the number of processes you can fork and openmpi does a great job keeping track of which cores are being used. *** phiGEMM *** ERROR *** Missing initialization. Do CPU-only. How to solve this problem and which release you have used. What type of GPUs are you using on this system? I have not personally worked too much with the actual programming of QE-GPU, but I have major experience with compiling that god awful GPU compilations. Thirdly, if you have a failed compilation, please make sure you start from scratch. If you do not, sometimes it finds previous partial builds. Thank you very much，I have my question resolved.